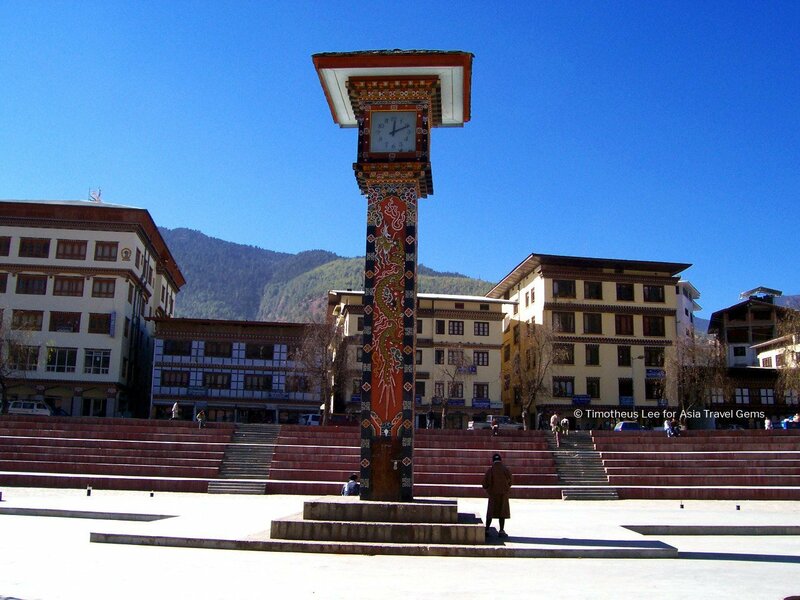 When you are in Bhutan, here is one of the Best Places to Visit In Thimphu Bhutan, and one of the things to do there. 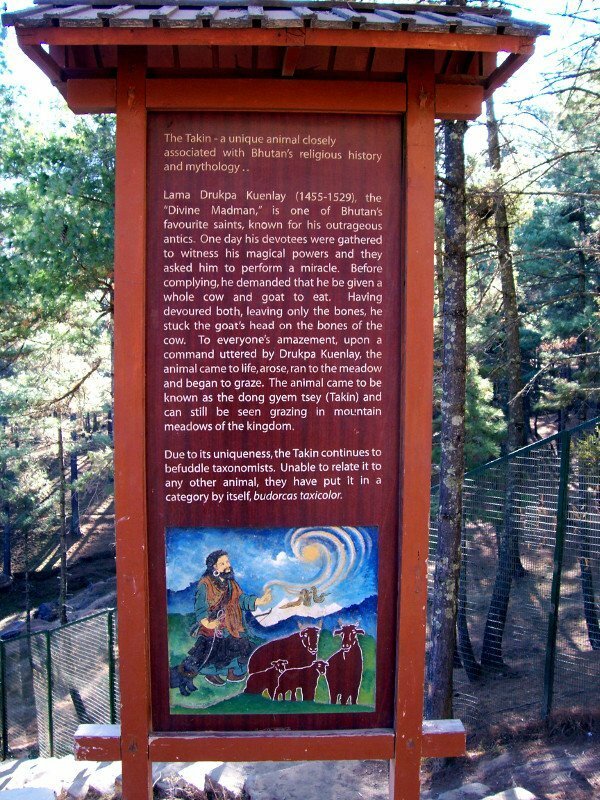 It is the Takin Preserve at the Jigme Dorji National Park to see the rare Takin – Bhutan’s National Animal. It is located at the Radio Tower Hill. You can easily spot it as there is a sign at the entrance, which is a little way from the actual preserve. You can see the WWF logo on the sign. WWF is for World Wildlife Fund. The Takin is classified as a ‘Vulnerable’ species. As such, it is Protected. The species survival is threatened by competition with the domestic yaks for food, and loss of habitat due to logging. At the preserve, the Takin is safe and continues to survive. The numbers of the Takin is slowly but surely growing. I visited the Takin Preserve with my friend who worked in Bhutan. We climbed long and steep flights of steps to get there. I was practically almost out of breath and panting by the time we reached the destination. When we reached the place, my friend asked me to take a photo of this road (see photo below). I took the photo, and out of curiosity, I asked my friend what was so special about that road? He answered nonchalantly that there was nothing special. Just that we took the shortcut that saved time. That road was the usual road tourists would take to visit the Takin Preserve. It was less steep and more scenic, too. Well, what do you know? The journey to the preserve could have been nicer and less exhausting. So when you visit this place, please take note. Consider this path. We reached an area at the entrance that looked like a stopover before stepping into the preserve. 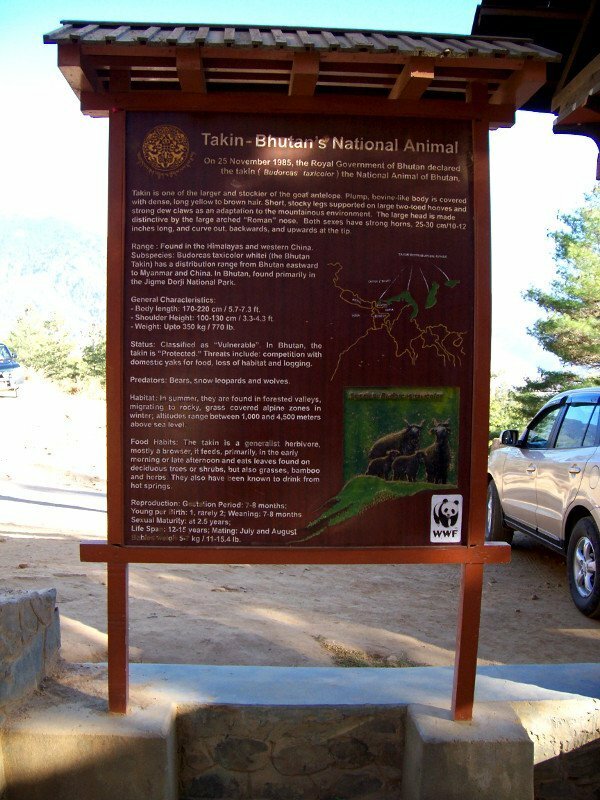 There were signs with details of the Takin – Bhutan’s National Animal. Here is one of them, and I have transcribed what was on the board to the text below. On 25 November 1985, the Royal Government of Bhutan declared the takin (Budorcas taxicolor) the National Animal of Bhutan. Takin is one of the larger and stockier of the goat antelope. Plump, bovine-like body is covered with dense, long yellow to brown hair. Short, stocky legs supported on large two-toed hooves and strong dew claws as an adaptation to the mountainous environment. The large head is made distinctive by the large arched ‘Roman’ nose. Both sexes have strong horns, 25 to 20 cm / 10 to 12 inches long, and curve out backwards, and upwards at the tip. Range: Found in the Himalayas and western China. 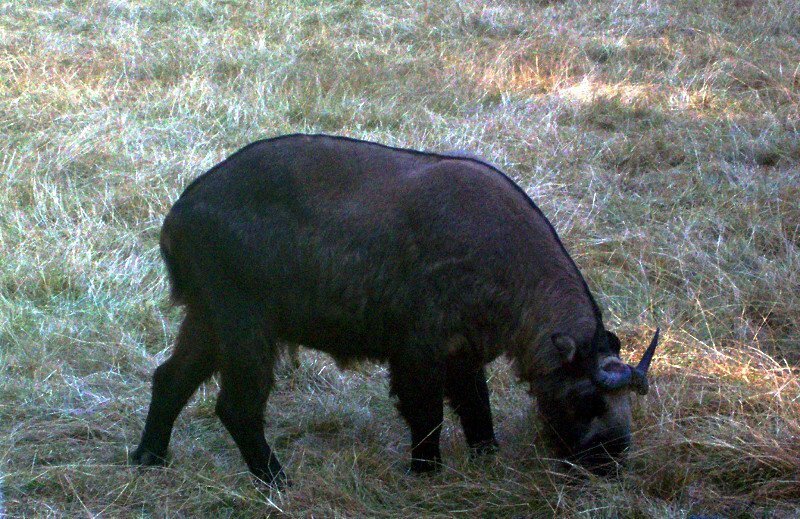 Subspecies: Budorcas taxicolor whitei (the Bhutan Takin) has a distribution range from Bhutan eastward to Myanmar and China. 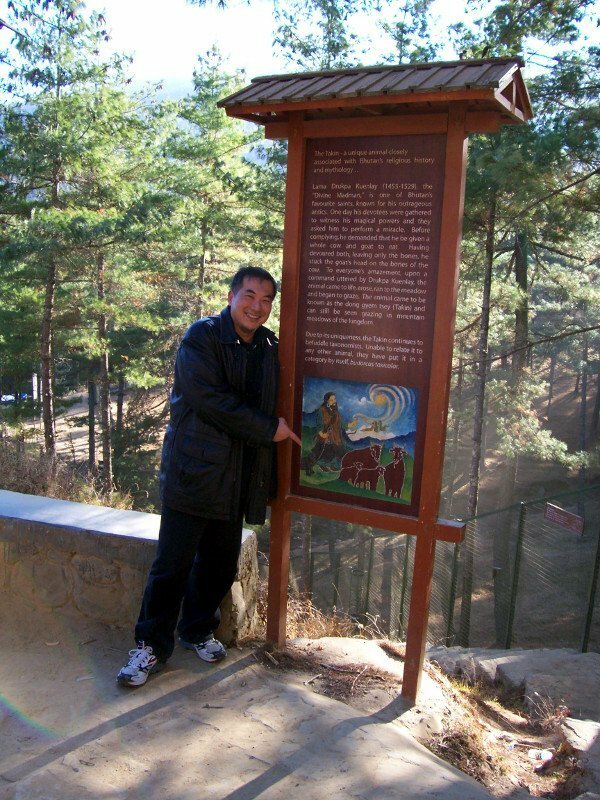 In Bhutan, found primarily in the Jigme Dorji National Park. Status: Classified as ‘Vulnerable’. 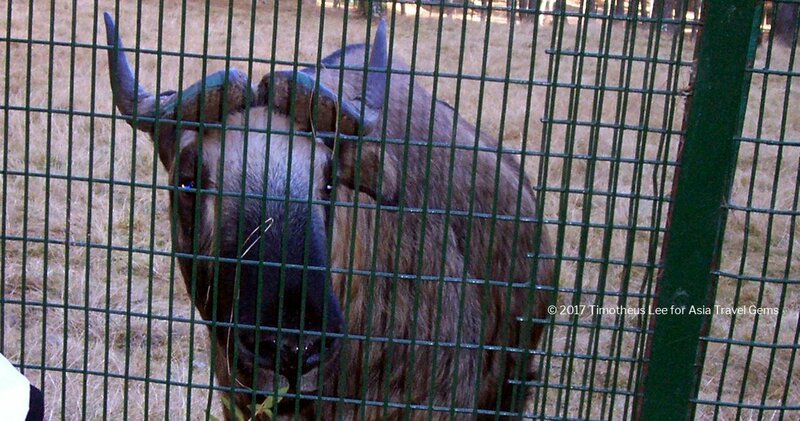 In Bhutan, the takin is Protected. Threats include competition with domestic yaks for food, loss of habitat and logging. Predators: Bears, snow leopards and wolves. Habitat: In summer, they are found in forested valleys, migrating to rocky, grass covered alpine zones in winter; altitudes range between 1,000 and 4,500 meters above sea level. Food Habits: The takin is a generalist herbivore, mostly a browser, it feeds, primarily in the early morning or late afternoon and eats leaves found on deciduous trees or shrubs, but also grasses, bamboo and herbs. They also have been known to drink from hot springs. There was another sign that you must not miss! This one presented the folklore of how the Takin was created. It is quite fascinating! THE TAKIN – a unique animal closely associated with Bhutan’s religious history and mythology. Lama Drukpa Kuenlay (1455 – 1529, is one of Bhutan’s favorite saints, known for his outrageous antics. One day his devotees were gathered to witness his magical powers and they asked him to perform a miracle. Before complying, he demanded that he be given a whole cow and goat to eat. Having devoured both, leaving only the bones, he stuck the goat’s head on the bones of the cow. To everyone’s amazement, upon a command uttered by Drukpa Kuenlay, the animal came to life, arose, ran to the meadow and began to graze. 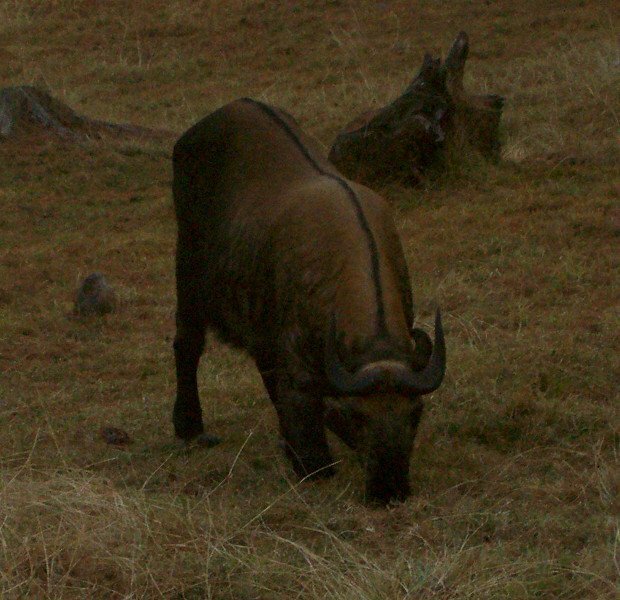 The animal came to be known as the dong gyem tsey (Takin) and can still be seen grazing in mountain meadows of the kingdom. Of course, I could not resist taking a photo next to this fantabulous sign. We proceeded to the enclosure where the Takin was. There was a fence all along the perimeter, and we did not see any Takin for a short while. Then suddenly, we chanced upon a few of them. The first thought that came to my mind was that they looked like deers! My friend looked around, and wondered where all the Takin where. He commented that usually there would be quite a lot of them. And they are very friendly. Round a corner, we found a few, grazing. Here are some photos of them. 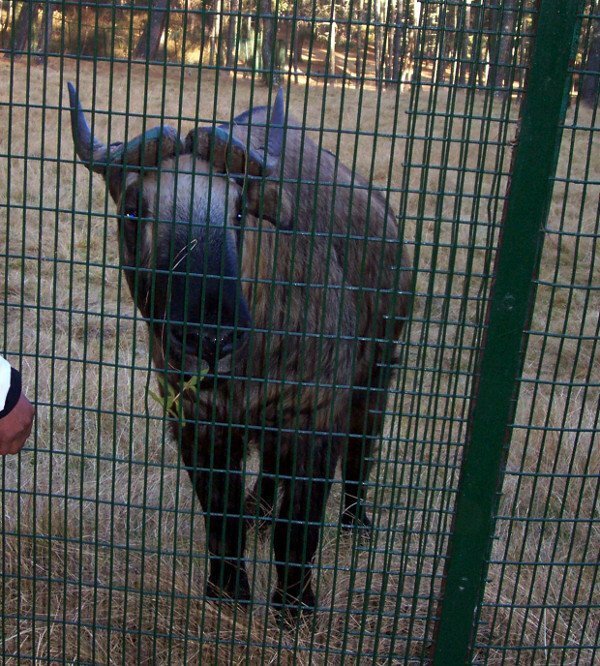 This particular Takin was very friendly. One of the locals, a Bhutanese man, was feeding it grass that he plucked from the area outside the fence. The Takin seemed to appreciate it. And looked at me when I took this photo. It had a slow and gentle demeanor. Its horns had a green metallic sheen at the top that gave the Takin a unique and almost pretty look. The Takin Preserve is a very peaceful and tranquil place. It was winter and most of the grass were dry and mostly brown. Everywhere there were tall pine, juniper and cypress trees that provided much shade from the hot sun. My friend and I sat on a bench, and enjoyed the immense beauty of the preserve. The quiet environment was very good for rest and respite. We chat and had a lovely time while we breathed the sweet scents of the pine, juniper and cypress trees. 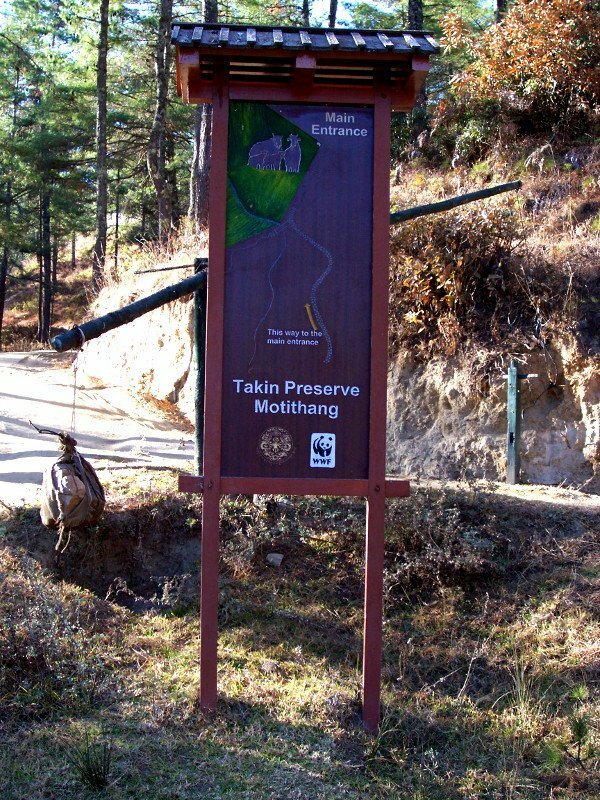 Do visit the Takin Preserve when you are in Thimphu Bhutan. It is definitely worth the climb up the hill to see it. We continued on to the top of Radio Tower Hill. To read the blog post about this, Click Here. 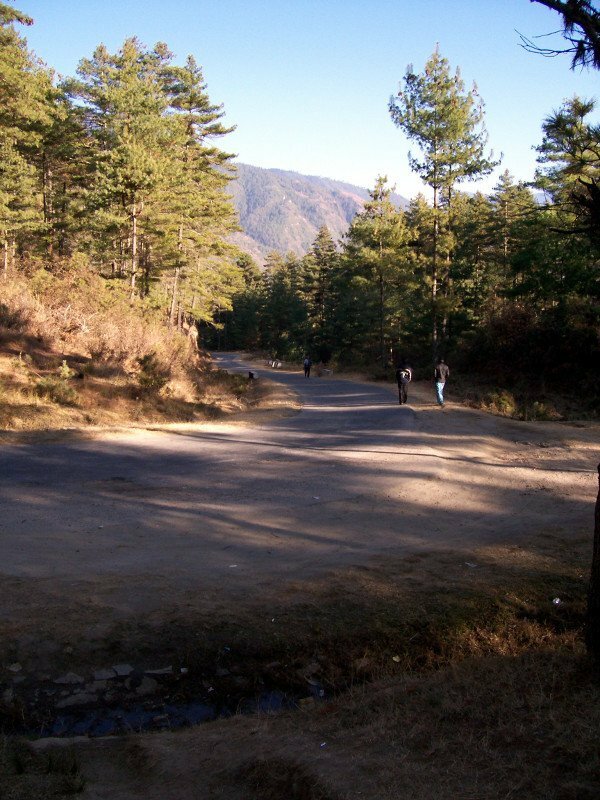 If you have ANY questions about this article, about Best Places To Visit In Thimphu Bhutan – Takin Preserve, ANY at all, please submit your questions as comments below. I will be happy to help you out. Wow, your post on the Tahin Bhutans reserve is fantastic and were it not for the fact that I am disabled, it looks like a place I would love to visit myself as you highlight some of the “Gems” of the place, so amazing work. Thanks for your kind praise, Simon. Bhutan is a really beautiful place. You made a good point. Bhutan does not seem to be disabled-friendly. Still, it is a nice place to visit, just to enjoy really fresh and crisp air, the peace and quiet, almost heavenly. Please do read the other posts, and upcoming posts about the country. Or you can sign up for our newsletter to get updates. Thank you for this Article ! It’s very interesting. It must be very tiring to climb long and step flights of steps to get there. And the Takin is so fascinating! Never seen anything like this before. Thanks Maisur! 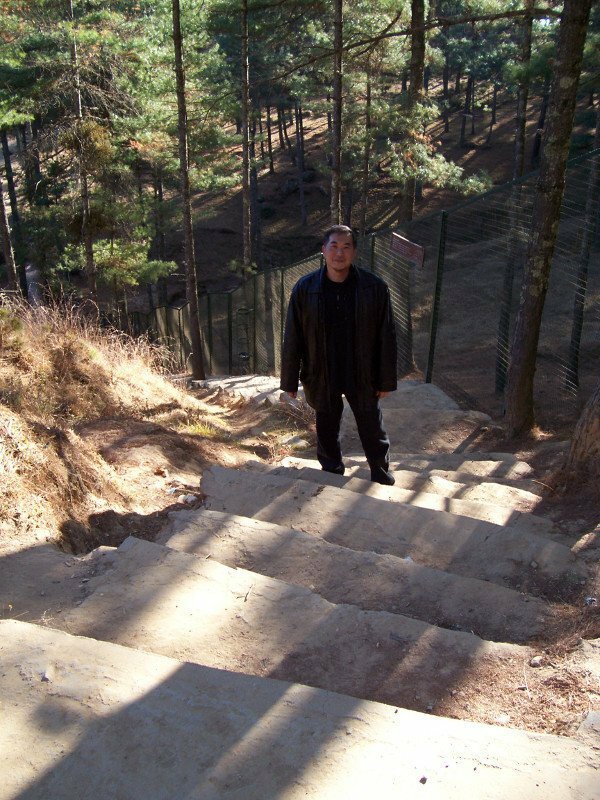 Yes, it was very tiring to climb up the long and steep steps. Even harder because of the thin mountain air. I love this post. You make it sound so interesting and almost has me booking a trip to Bhutan, just for this. Your commentary and your pictures bring it to life, and really make anyone want to go to the Takin Preserve. They are really a beautiful animal, and I had actually never heard of them before, so that was interesting all in itself. Thank you for sharing this very informative post! What a nice blog post. The Takin is so cute! Thanks Hazel! It is, isn’t it? And it is such a gentle and sweet creature. Thank you Timotheus for introducing the Takin so well! You’re welcome Thomas! Glad to share. I’m starting to really love your site and am starting to fall in love with Bhutan even though I haven’t visited yet! I heard from a friend that the people of Bhutan are a really peaceful, happy & spiritual people, which makes me want to go even more! If I planned to travel around Bhutan, how long do you think I would need to make my holiday to see all of Bhutan? Many thanks for your kind words. So very happy you love this site. And that you are falling in love with Bhutan. I fell in love when I visited, and constantly think fond thoughts of this amazing place. Yes, your friend is correct. Bhutan is really peaceful, and the people are really happy and spiritual. Everyone is so friendly, and greets strangers with a smile and sweet hello. Which I did, when I was there. Also, it was because I was invited. If you are not invited, you must travel with a tour guide. So you have to purchase a tour. 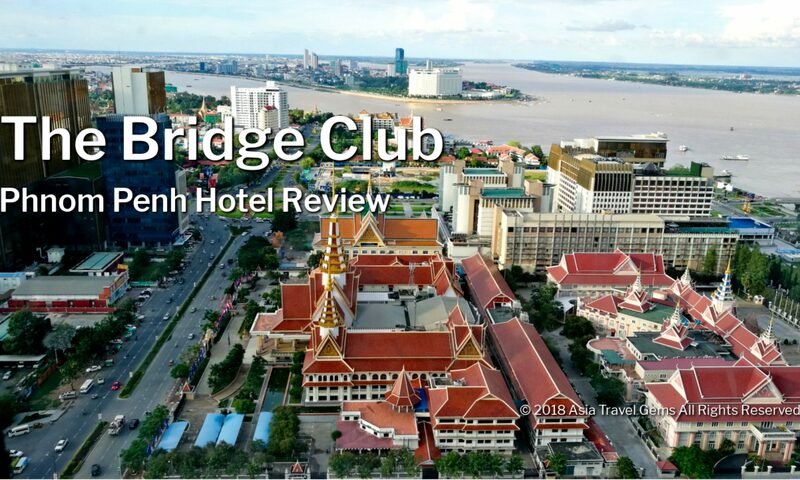 I will be adding links to suggested and trusted tour groups soon. Watch for that. Next PostNext Asia Travel Gems Wishes Everyone A Happy Chinese New Year of the Fire Rooster!